The roundhouse kick is a ‘rotational’ kick that has biomechanics similar to a soccer kick. 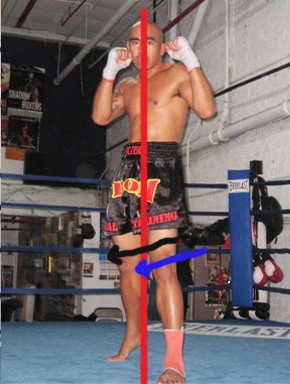 In Thai boxing fighters will use their shins rather than their feet to make contact (and inflict damage) on their opponents. When teaching the roundhouse kick, the symbolic technique of Muay Thai, I think it needs to be broken down into 2 major elements, and maybe another 2 or 3 sub-elements. The main power of the kick, comes from the rotation of the body, rather than the actual kicking leg. When people think of a kick, they impulsively try to generate all the power from extending the knee – but the bulk of power comes from the rotation of the body and the transfer of weight. The Traditional Way is much quicker, but the Unorthodox Way can generate more power. It’s also easier and quicker to use the traditional method when ending a punch combination with a kick. When someone isn’t checking the kick, or when throwing a kick straight off without a set-up, I do like to step across and turn my foot to the side, rather than rotate on the ball of my foot. Instead, I jump-step forwards and to the left, to create the rotation in my hips for the kick. I even push off my right foot first, before stepping across with my left foot. This gives the kick more power, although it does help that my opponent is walking forwards and into the kick. 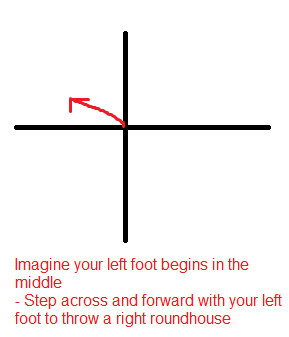 By stepping across with your left foot as you throw the right kick, you penetrate the opponent’s “centre-line” by a much more significant amount. This means that more of your body weight contributes to the power of the kick, and you ‘displace’ more of the opponent’s leg. The Jumping Technique that I use in the GIF above is a lot riskier however. You can easily jump head-on into a punch. I used it in this competition because I could see that my opponent was badly fatigued. Make sure to set up the kick well if you do use the step-across technique to generate additional power. As you land your kick, you should initiate a second movement – push your hips forward so that your body straightens, and rotate your upper body so that it is inline with your hips again. If you are throwing a right kick, your hips should straighten, and your left shoulder should rotate all the way backwards, so that you are almost looking behind yourself. Not to pick on my friend Lee – this was his first time training, but you can see how his upper-body doesn’t rotate at all as he throws his kick. You don’t want to make a little 3 inch dent in the tree, you want to chop all the way through from right to left (or vice-versa). For a leg kick, don’t think about just kicking the leg, think about driving all the way through and through his centre-line (represented by a red line in the pic below). The lead leg is typically angled outwards slightly, in that the foot is standing wider than the hip on the same side. This allows a ‘downward-angled’ kick to dig in, rather than skip of the surface of the leg. To avoid a counter from a straight punch – move your head off to the side when you move into kicking range. This decreases the chances of a punch counter. Setting up the kick with a jab or a feint, or using it as a counter, is also a way to decrease the chances of you getting caught with a punch. Or – wait for him/her to throw a kick – check and counter. I learned this the hard way when I first went to a Muay Thai gym, everyone was counter kicking and punching me when I was jumping in with big kicks, the would stay in the pocket and counter me. Making waves in the UFC at the moment is the calf kick. With less muscle around the ankle and calf, the calf kick can be devastating. Kicking just below the knee, rather than just above the thigh; the kick can work as a damaging strike or as a sweep. Calf kick are also regarded as lower risk than thigh or body kicks as they put you less off balance. The traditional karate style roundhouse kick, is more of a snapping kick, using the leg muscles rather than the power generated from the core and the actual shift of weight. The karate style carries a lot less power but is arguably the best style for headkicks. With no ‘load up’ it’s harder to see the karate high-kicks coming and the weight of the shin and foot provide plenty of force to KO an opponent without transferring all of your bodyweight etc into it. I would suggest however that the powerful style of Muay Thai roundhouse is much more effective for kicking the legs and possibly the body. Condition your shins by kicking the heavy bag. Don’t go straight into kicking baseball bats or anything silly, build up slowly by kicking the bag…then try sparring without shinguards. Sparring without shinguards is actually safer (normally) as everyone tends to kick much lighter! Taking kicks on your legs, shins and calves is actually the best way to condition your legs to take kicks. Using Box Jumps & Plyometrics is also a great way to build up your shin strength. The impact and load on the bones will cause ‘bone to grow stronger’ (to put it in layman’s terms – to learn more about Wolff’s law and bone strength click here). 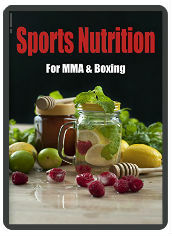 To stop a Muay Thai fighter throwing roundhouse kicks at all, you can attempt to move forwards constantly. He would rush forwards, so that it was near impossible to throw a roundhouse kick – by the time it was thrown, Bob would be in punching or clinch range. To use this tactic you need to be able to counter front kicks and jabs. If technique is everything, then the set up is almost everything! The roundhouse, especially the high roundhouse can be countered with straight punches – and you can easily get caught off balance. A great way to set up for a headkick, is to kick low once or twice i.e. kick your opponent’s legs. Then next time – look low at the opponent’s leg but this time kick high. The Dutch style of kickboxing, involves throwing the roundhouse at the end of a punch combination. Using punches makes your opponent ‘fight on two fronts’ and hides the kick to a certain extent. A general tip for setting up a powerful kick is to throw feints. Keep twitching your hips and shoulders to gauge your opponent’s reaction. You can also consider throwing a ‘feeler’ kick, with a low amount of power, again to gauge your opponent’s reaction. The roundhouse can be quite ‘telegraphed’ if you don’t set it up well with punches and feints. This is the common back-up-technique, it carries more risks but it is often an instant KO if it lands. To do this develop a strong core with stability ball exercises and unstable surface work. Planks are also good for building a ‘base’ of core strength. It’s a good idea to build this base to protect your back and spine, before doing explosive rotational drills & kicking which could lead to injury if you have a weak core. Men beware of ‘anterior pelvic tilt’. This is something I have a big problem with thanks to sitting down all day in work and during the commute. Again, doing powerful kicks with poor posture will put a strain on your lower back. Ensure that you correct this pelvic-tilt with lots of hip mobility work. *Once you have your ‘base’ of good posture & a strong core, these exercises will quickly develop explosive kicks. Technique is paramount still, however, never replace good technique with conditioning work. Technique is everything with the roundhouse! Don’t make the mistake of thinking that strong legs mean a powerful kick – it’s all in the explosive hips & core. 10 x Low Kicks – As hard as possible. KettleBell High Pulls – 2 sets of 8 reps (8 reps on each arm…so 16 reps in total per set). Kettlebell exercises are great – but you can really damage your back if they are done incorrectly. You ideally need to get a PT or a friend/mentor to show you the technique. Make sure that you are looking fowards and you shouldn’t ‘slouch’ your back. If you can’t get a PT or mentor, then start with a VERY light weight, and film yourself to assess your technique. *Study here on the mechanics of a powerful kick. Effective roundhouse kicking performance was characterized by rapid pelvic axial rotation, hip abduction, hip flexion and knee extension velocities, combined with rapid movements of the COM towards the target. Olympic Lifts, plyometrics and medicine ball drills with rotation are the best ways to develop this type of power. Be careful not to overtrain however! Olympics lifts help with hip extension; you can use band, hammer and medicine ball exercises to make your hips have more rotational power. Remember, the correct technique is crucial for developing a powerful roundhouse kick. Stay relaxed and loose until you make contact with the opponent. As with a hook, when throwing a round kick, think about getting your hips through first, this loads your leg with elastic energy as it whips through after your hip has rotated. Then the second movement is making contacting, driving into the opponent’s leg/body and extending your hips. Stay relaxed throughout, think about ‘relaxed speed’ not power. Relaxation & good mobility is key for an effective striking style. Although hip mobility is crucial for high kicks, you need good posture and therefore good flexibility to train & drill explosive roundhouse kicks without getting injured. If you sit down all day at work, or drive a lot, you will need to stretch your hip flexors. With a hook I tell people to imagine throwing a discus, the hand with the discuss comes through after the hips and shoulders. Same for a hook, and kind of the same for a kick. – Bend your leg and then extend it before it lands. Some people say not to do this, and to imagine your leg as a baseball bat and kick it straight. The roundhouse kick is a great weapon to have in your arsenal, whether it’s for MMA, Thai Boxing or even self defence. Not everyone has a KO punch, but with the correct transfer of weight, you can develop a devastating low leg kick roundhouse that will stop many opponents – especially those who are not used to absorbing the impact. Interesting fact – Foot protectors do not reduce the damage caused (at least to a dummy) by a roundhouse karate kick. Fourteen karate experts punched and kicked the dummy. Accelerometer measurements in the 90- to 120-G range indicated that safety-chops (hand protectors) and safety-kicks (foot padding) did not reduce acceleration of the dummy. Ten-ounce boxing gloves mitigated peak acceleration to some extent. Kicks and punches produced accelerations in the same range.